Savvy Mode: Bell Bottom Trendy Again? Looking at Katie Holmes, I have suddenly realized perhaps bell bottoms are trendy again. Great, after I donated every last pair thinking I would never wear bell bottoms again. I like how she layered a short jacket over a longer top. But, the top is asymmetrical, shorter in the front and longer in the back. This way, her outfit will not look long and loose on top, and wide and loose on the bottom. A gal can appear wider allover as result. She is wearing a pair bell bottom jeans by Seven for all mankind. Of course, as Seven is one of my stable brands, I have no problem finding 3 pairs to my liking. I pick out tops that are more form fitting. I don't think we need to wear skin tight tops, but we need to pick tops to cinch in around the hip areas (showing some definition) to avoid the wide look on top and bottom since bell bottoms are quite wide. How will you wear bell bottoms? For me, I will pick pieces like Ella Moss orange top with ombre bell bottom and beige Jimmy Choo wedge for the casual look. bell bottom jeans are gorgeous is you have long legs! i don't think i could pull if off! Hmm, I think I'm too short for bell-bottoms, I would actually look like a bell! I like bell bottom jeans! Thanks for the tips. I love how bell-bottoms look on other people, but I feel I have yet to find a pair that looks good on me -- judging from pictures from a few years ago! I love bell bottoms, I must get a new pair! I love them....glad that they are back! I'm not really feeling the bell bottoms, myself. I just threw out bell bottom jeans that I got two summers ago.I am not going to buy more. I think I am better off with a denim trouser than with any other cut. I absolutely adore my bellbottoms and have kept a couple of them for years, no matter what the style of the moment might be. I think the bigger the bellbottom, the better! I love 7 FAMK jeans but their inseams are waaaay too long for me as I'm short. :o( I really wish they came with shorter inseams. Bell bottoms are not a good look on me. I do love the Juicy black & white top and Jimmy Choo wedges. Hopefully the majority of women wont follow this trend. Noooooooooooooooooooooooooooo!!! Does that answer your question! That is one of my fashion nightmares! I like bell bottoms, I've a not exagerated pair from gap that I like very much. I'm afraid my days of bell bottoms are over--i'll stick with my bootcuts, wide legs and skinnies! I wish i could pull them off though! I like the dirty vintage look, too. I've never like bell bottoms.They look better on other than on me. Im so tall so I like my straight legs or skinnies. I don't care how trendy they are, I will not wear bell bottoms. 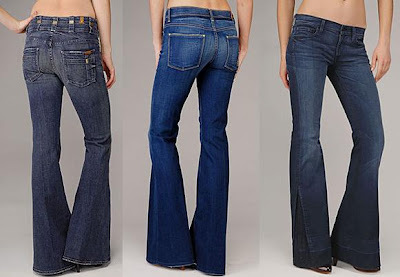 I am a true lover of bell bottoms, they have a slimming effect to boot!